SMOKE ALARMS SAVE LIVES!. . . what you need to know. A smoke detector is the only thing in your home that can alert you and your family to a fire 24 hours a day, seven days a week. Whether you are awake or asleep, a working smoke detector is constantly on alert, scanning the air for fire and smoke. 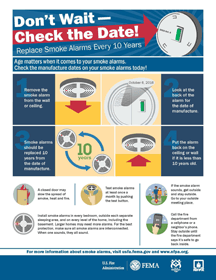 Smoke detectors must be kept maintained! Keep it free from dust and if it is powered by battery, test it on a monthly basis by pushing the “test” button if it has one. The Florence Fire Department will install battery-powered smoke detectors in Florence homes that have no detectors or to replace detectors that are more than 10 years old. For the duration of this grant-funded program, the detectors are provided free of charge. For more information, call 520-868-7609 or Fill out the form below.